Australians are turning to premium cars at an increasing rate, and particularly premium SUVs. Mercedes-Benz forecasts that boom to continue dramatically beyond 2020 and has an expansion plan to match, but here and now the Mercedes-Benz GLA-Class is its belated first shot at the premium compact SUV class. For the next few months only the entry-level $47,900 GLA200 CDI diesel is available to local buyers. While that grade is a near price-match for the equivalent Audi Q3 and BMW X1 diesels, neither was available to test. 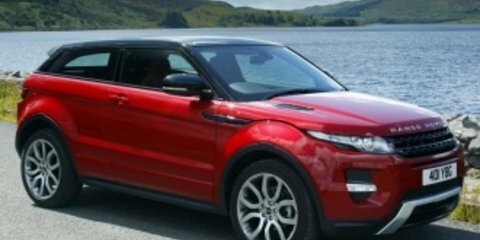 Instead we grabbed the best car in the segment and one that like the GLA-Class is more fashion-focused, the Range Rover Evoque. It has also just been revised with a new nine-speed automatic. The entry-level $49,995 Evoque eD4 Pure diesel front-wheel-drive wasn’t available to test, though the all-wheel-drive version with identical power was, and it’s here priced from $55,875. The Evoque straddles the line between the Q3/X1 compact SUV class and the Q5/X3 medium segment. It is actually 62mm shorter in length than the GLA-Class – 4355mm plays 4417mm – though the Range Rover is much broader, 1965mm wide versus 1804mm for the Mercedes-Benz. The GLA-Class walks its own distinctive path, too. It isn’t outwardly a high-riding SUV like the Evoque or Q3 are, but nor is it a lower wagon-style SUV like the X1. With its sloping roofline and curved edges, it simply looks like a beefier version of the A-Class hatchback on which it’s based, and that sits just fine with Mercedes-Benz; mixing the fashion of the A with a bit of extra versatility is, it believes, a recipe for sales success. Although the Mercedes-Benz GLA-Class will be available with all-wheel drive (from $57,900 with a 2.0-litre turbo petrol engine), don’t expect it to follow the Evoque down an offroad path. In terms of its height, the Mercedes-Benz sits at a squat 1494mm, its roofline a full 112mm lower than that of the Range Rover. There’s less ground clearance and obviously no offroad mode – the Evoque conversely uses its all terrain response system with several modes to be the best offroader in the segment. It also means the GLA-Class doesn’t have the high driving position of the Evoque, which may be a deal breaker for some SUV buyers. You slide down and into the Mercedes-Benz where you shift across and onto the driver’s seat of the Range Rover. Once seated, the relatively narrow glasshouse of the German SUV makes visibility more restricted compared with the relatively airy glasshouse of its British rival, at least up front. As you go further back in that rival the side beltline increases sharply so over-the-shoulder visibility is restricted courtesy of its rear windows and tailgate glass that are far smaller than the front. Chunky rear pillars mean the GLA-Class is no better or worse for reversing visibility, though Benz includes a swag of driver assist technology that is either absent or optional in the Range Rover. In addition to front and rear parking sensors, the GLA200 CDI includes a reverse-view camera and technology that can detect a parallel or perpendicular parking spot then move its steering wheel (while the driver judges the speed with the pedals) to navigate itself into the spot. It works brilliantly, too. In the Evoque Pure, only rear parking sensors are standard. Front sensors add $620 to the price, but in order to option a reverse-view camera for $670 or auto-parking for $1350, you first have to option a Tech pack for a hefty $4500. As fitted to our test car, that pack adds 18-inch alloy wheels, rear cupholders and air-conditioning vents, and leather trim, all of which is already standard in the Benz, in addition to an 8.0-inch touchscreen and 11-speaker Meridian sound system. To almost completely match the equipment standard in the GLA200 CDI, the Evoque Pure still requires a further $3400 for satellite navigation, $1870 for automatic xenon headlights and wipers, and $1000 for a power tailgate. Add all of the above and the list price totals an eye-watering $68,015. Even then the Mercedes-Benz includes standard seatbelt tightening in the event of an accident, and blind-spot warning and forward collision warning systems that are only available on higher-grade Evoques. Both get standard stability control and nine airbags, though, including dual front, side, full-length curtain and driver’s knee protection. Both also include alloys, foglights, cruise control and dual-zone climate control. 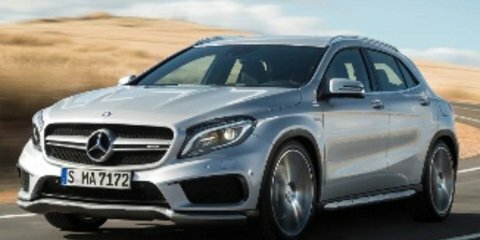 The only further options fitted to our GLA-Class were an AMG Line styling package ($2490), Comand navigation that is more sophisticated than the standard Becker unit ($2490), a panoramic sunroof ($1490) and electrically adjustable front seats ($900), which along with expensive metallic paint ($1190, although the Evoque’s costs $1300) totals $56,550. If it’s an emphatic round one victory for the GLA-Class, then the Evoque claws back some ground with a more premium interior. From the stitched dashboard surfacing to the classy trim finishes and tactile controls, the Range Rover has its rival soundly beaten. That said, optional rear air vents and cupholders (to match the standard twin fronts) and no rear grab handles isn’t what you’d call generous. Unlike the Q3 and X1 that share some components with their A3 and 1 Series hatchback equivalents yet feel completely different inside, the GLA-Class is largely a facsimile of the A-Class. In terms of the vertical-needle white-on-silver instruments, aviation-style air vents and high-mounted Mercedes Comand screen that’s no bad thing, but there are some hard and scratchy plastics that neither look nor feel like $50K worth. Choosing the Comand infotainment system option does bring digital radio and internet apps connectivity to the GLA-Class, however, both features of which are not available in the Evoque. Comand in this application is simple to use via a single rotary dial on the centre console, where the Range Rover offers a slightly more fidgety touchscreen display. Neither are standouts for screen resolution, though for sound fidelity the Rangie’s 11-speaker Meridian system is superb, eclipsing the Harman Kardon unit that comes packaged with Comand in the Benz. The GLA-Class does, however, require its own dedicated iPod/iPhone connection plug (complicated if you have an iPod and an iPhone that require different charging plugs) where the Evoque accepts a standard USB cable. Both include voice control commands, which are easier in the Benz because it shows the commands (or is that Comands?) on the display. Further rearward and it’s perhaps unsurprising to find the longer-bodied Mercedes-Benz matches the Range Rover for rear legroom. Although both a have similarly supportive seats, the rear seat base in the GLA-Class is lower to the floor forcing a knees-up seating position for taller passengers. There’s less toeroom behind the lower-positioned driver and front passenger, and a lot less headroom, which isn’t helped by the optional sunroof and black rooflining on our test car that makes it feel cave-like back there. Compared with the broader Evoque, there’s also visibly less shoulder space for a middle-seat passenger and the centre tunnel is more intrusive. Surprisingly, the Evoque doesn’t get rear roof grabs, though it joins the GLA-Class by offering three top-tether child seat anchor points, two each with ISOFIX mounts. If your crew is small the GLA-Class will do fine, but lankier teens and families bursting beyond four will be far more comfortable in the Evoque. With a bigger crew also comes more gear to stick in the rear, and the Range Rover’s boot is 37 per cent more capacious – 575 litres versus 421L. And despite the Benz rolling on run-flat tyres, it offers no spare wheel (only an underfloor storage compartment) where the Evoque features a full-size spare. The Benz does include a ski port where the Rangie doesn’t, although 12v power sockets, tie-down hooks and a 60:40 split-fold rear seat are found in both, though neither SUV’s backrest folds flat to create an even loading area for larger items. More people and luggage also means these SUVs will have to work harder to move them, but under the bonnet they are closely matched. Both utilise four-cylinder turbo diesels – Land Rover with a 2.2-litre that produces 110kW of power at 4000rpm and 400Nm of torque at 1750rpm; Mercedes-Benz with a 2.1-litre that delivers 100kW between 3400-4000rpm and 300Nm across a 1400-3400rpm plateau. While power figures are closely matched, which makes the 0-100km/h acceleration claims close – 9.6 seconds Evoque; 9.9sec GLA200 – it is the torque figures responsible for how effortless these SUVs feel. Although the Evoque has a 100Nm advantage, all-wheel-drive hardware means it also weighs almost 100kg more than the GLA200 CDI – 1685kg versus 1595kg. Interestingly the front-drive Evoque exactly matches the kerb weight of its rival, despite being dimensionally larger. On the road the extra torque comes to the fore in the Range Rover. Thanks to a short first gear inside its nine-speed automatic transmission, it moves from the traffic lights more swiftly than its rival. While there is still some delay between a press of the throttle and actual movement, the turbo lag is far less noticeable than it is in the Mercedes-Benz. The GLA200 CDI comes with a seven-speed dual-clutch automatic transmission that is hesitant off the line and makes creeping in traffic a chore. Even in an urban context the driver needs to push a button on the dash marked ‘S’ for sport to endow the Benz with decent throttle response and prevent it from sluggishly defaulting into tall gears. Conversely, though, sport mode hangs onto revs too long, highlighting the engine’s diesel clatter. The Benz engine has plenty of clatter at idle, too, though it smoothens out at speed. It takes sometime getting up to speed, though, and the auto lacks the crisp and immediate responses of its rival. The Evoque is quieter and feels punchier, and in its sport mode the nine-speeder has a gear for every occasion, and knows when to use each one of them (though it is debatable whether a diesel with a narrow power band needs such a suite of ratios). Both SUVs offer family-friendly economy. Across a test loop that comprised freeway and country road driving we achieved 7.2L/100km in the Evoque and 6.1L/100km in the GLA200 CDI; each about 1.0L up on their respective combined cycle consumption claims of 6.0L/100km and 5.1L/100km. Both also come with fairly unobtrusive ride quality. Around town the Evoque’s ride is firm and sensitive to surface changes, and it can get a bit fidgety in the same spots the GLA-Class remains calm and unaffected. On rough roads, the GLA-Class on standard ‘comfort’ suspension is noticeably softer in the control of its body movement. That’s no bad thing, though, because despite this the low driving position connects its driver with the sportier of the two models, with the GLA-Class mixing decently precise and mid-weighted steering with an eager and balanced chassis. The Range Rover doesn’t roll as much as the Mercedes-Benz in corners, and its steering is fantastically fluent where its rival’s is merely good. With chubby tyres and standard suspension, however, it feels a bit like it’s walking on stilts. It misses by some margin the brilliant handling of higher-grade models with optional larger, low-profile wheels and adaptive suspension, the latter of which is a $1950 extra on Prestige and Dynamic grades keen drivers should consider. While both of these SUVs look fashionable on the outside and largely feel well made inside, the entry-level diesels are not the picks of the breed. To make each feel properly premium, more expensive models need to be selected. In the case of the Mercedes-Benz GLA200 CDI its performance and refinement aren’t to a premium standard, while the same can be said for the short standard equipment list of the Range Rover Evoque Pure TD4. Both GLA-Class and Evoque are available with demonstrably superior 2.0-litre turbo petrol engines, but in the Benz that costs $58K (but comes fully loaded), where in the Evoque’s case it’s $61K plus many options. We’d choose a GLA250 4MATIC over a same-price Evoque diesel every time, but in this particular test it’s the roomier, quieter Range Rover that noses ahead of its compact and fun, but slow Mercedes-Benz rival.